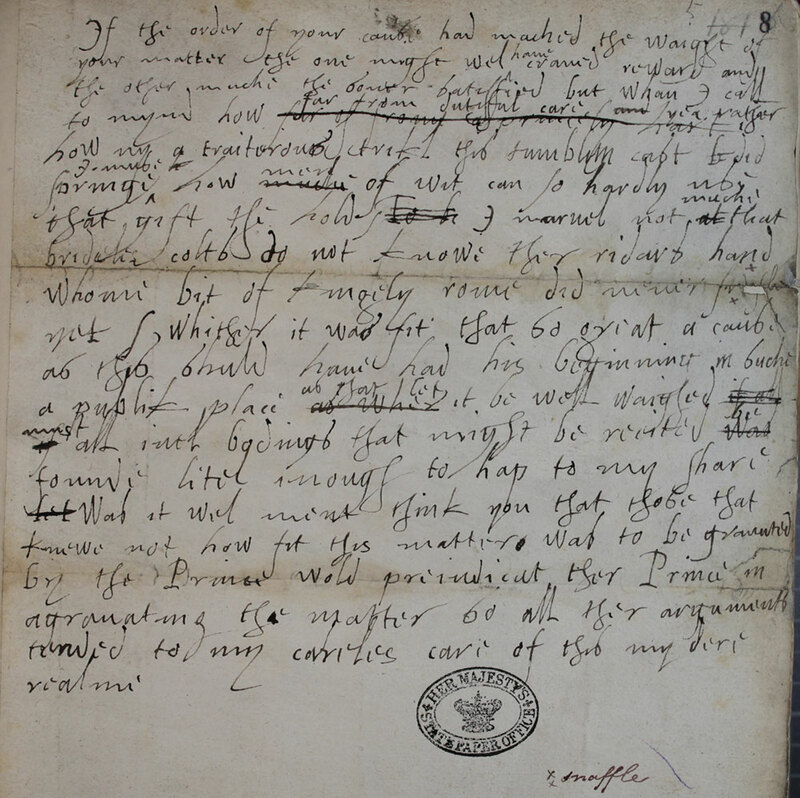 In November 1566, a delegation of 60 Lords and Commoners met with the queen to urge the question of her marriage and the succession. By now, eight years into her reign and aged 33, Elizabeth was under more intense pressure about this than ever before. Her response was unusually haughty and immoderate, which betrays the stress under which she was labouring. It was probably spoken impromptu and recorded after the event, then reported to the full Parliament. If the order of your cause had mached [matched] the waight of your matter the one might wel have craved reward and the other muche the sooner satisfyed but whan I call to mynd how far from dutyful care, yea, rather how ny [night] a traitorous trik this tumbling cast did springe I muse how men of wit can so hardly use that gift they hold. I marvel not muche that bridleless colts do not know ether ridars hand whom bit of kingly reine [or ‘reign’, a pun] did nevere snaffle yet, whither it was fit that so great a cause as this shuld have had his beginning in suche a publik place as that, let it be well waighed [weighed]. Must all evill bodings that might be recited bee founde litel inough to hap to my share. Was it wel ment think you that those that knewe not how fit this matter was to be graunted by the Prince wold prejudicat [judge in advance] ther Prince in aggravating the matter so all ther argumentes tended to my careles care of this my dere realme.